We have learned a lot this year about asparagus. It was our first year harvesting our brand new patch. 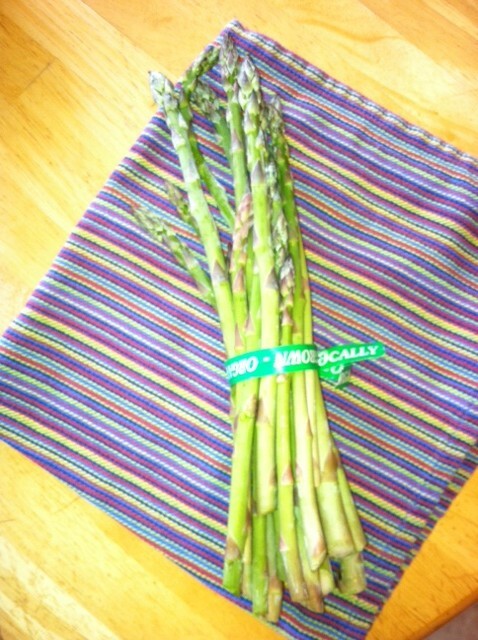 I have always bought asparagus in the spring either at the farmer's market or the grocery store. The first thing that surprised me about this delightful vegetable is that the spears come out of the ground a lot fatter then I ever imagined. At the beginning of the season, asparagus emerges from the ground 1/2, 3/4, or 1 inch thick. Wow! As the season progresses, the size of the spears emerging gets skinnier and skinnier. When 3/4ths of the patch is about the size of a pencil, you go ahead and let it be for the year. Those big fat spears that you see at the farmer's market and the grocery store have been growing the same amount of time that those pencil thin spears have. So now when you see fat asparagus you will know that asparagus season has started and when you see the tiny thin ones, you will know it is ending. Here is a quick and tasty dish that you can make for brunch, lunch or dinner. It has my favorite herb in it, tarragon! I will have to post my favorite Green Goddess Dressing recipe here this summer. Tarragon is the star of that particular amazing recipe. It is really wonderful in this simple recipe as well. This recipe is from Moosewood Restaurant New Classics by The Moosewood Collective. The only thing I did differently was chop the asparagus up into 1 inch pieces and mix them in with the eggs and dressing. I also had baby spinach so I used a bunch of that instead of the lettuce leaves. Place the eggs in a saucepan with cold water to cover. Bring to a boil and then lower the heat and simmer for about 10 minutes. Drain the eggs and cover with cold water. In a mixing bowl, combine the mayonnaise, tarragon,mustard, lemon juice, salt, and pepper. As soon as the eggs are cool enough to handle, peel and coarsely chop them. Stir the eggs into the dressing. Set aside. Rinse and stem the asparagus. Steam or boil the spears until bright green and just tender, 3 to 5 minutes. Plunge into cold water, drain, and cut into 5-inch pieces. Warm a large dry skillet on medium heat. Warm the tortillas one at a time for 20 to 30 seconds on each side, until softened. Lay each warm tortilla flat on a work surface. Center a lettuce leaf on each and top with about 1/3 cup of egg salad and several asparagus pieces. 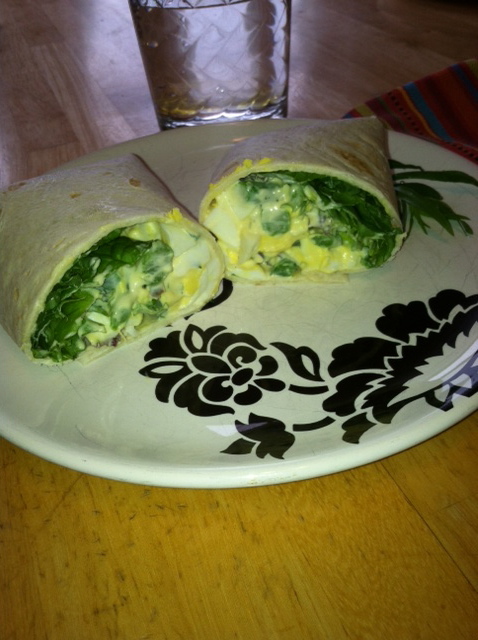 Fold in both sides over the filling and then roll from the bottom up to form a wrap. 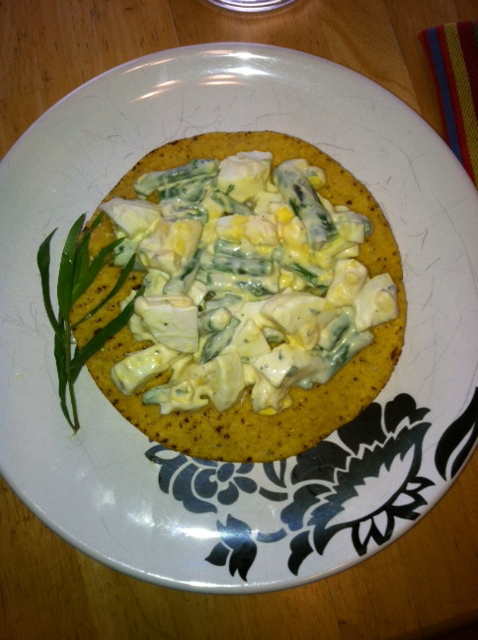 It also makes a yummy tostada too if you, like one of my kids, prefer. Enjoy!